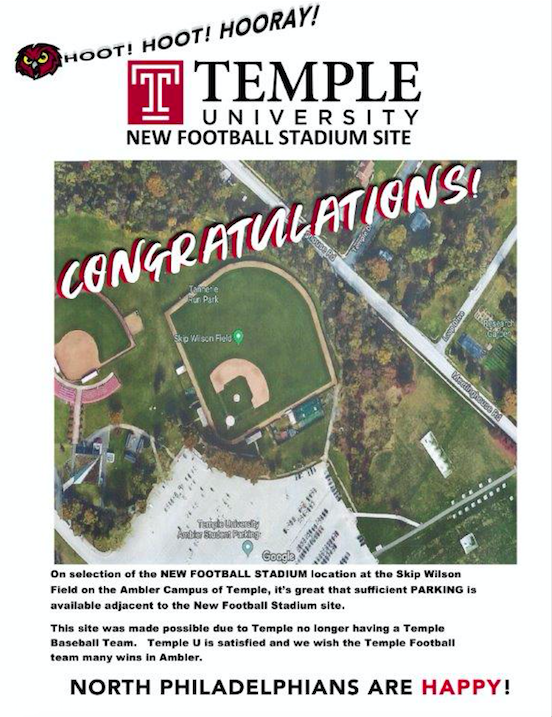 A flyer distributed at Temple University's Ambler campus suggests the location as an alternate site for a football stadium the university wants to build on its main campus in North Philadelphia. The movement to prevent Temple University from building a 35,000-seat stadium in North Philadelphia entered a new theater this week: Upper Dublin Township. The groups making up the No Stadium No Deal Coalition want the university to build its football stadium at its Ambler campus in the Montgomery County town. After a May Day demonstration on North Broad Street, the coalition distributed a flyer to those attending a trustee meeting at the Ambler campus. Comprised of Stadium Stompers, the Black Clergy of Philadelphia and student groups aligned against the stadium proposal, the coalition laid out the case for the alternative site. Flyer distributed at Temple University's Ambler campus. 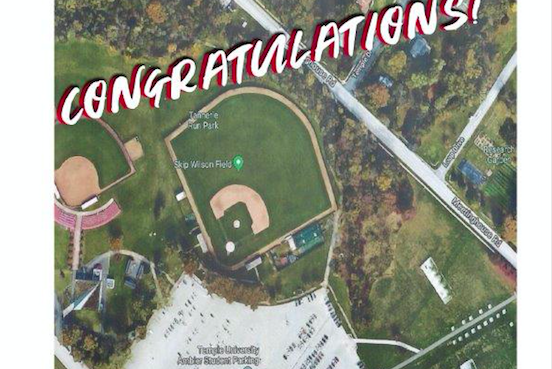 Skip Wilson Field, located at 580 Meetinghouse Road, hasn't been used since Temple axed its baseball team in 2014. The field currently contains two baseball diamonds. "There's enough land for five football stadiums," said Marilyn Kai Jewett, a coalition spokeswoman. "The diamond is not being used, so put it there. It's easy to get to using (Route) 309 or the (SEPTA Regional Rail) train. It's not bothering the neighbors. It sounds like a great place to be." Temple's Ambler campus is about 30 minutes outside of Philadelphia and has about 4,000 combined graduate and undergraduate students. The main campus in North Philadelphia has a total enrollment closer to 40,000. The proposed $130 million stadium in North Philadelphia, pitched by the university as a multipurpose facility, has drawn ire from lifetime residents of North Central Philadelphia who believe the project will negatively impact their quality of life. 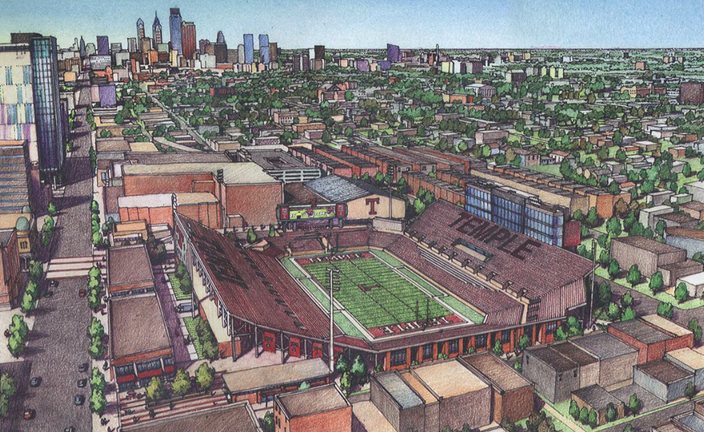 Temple believes the proposed stadium, drawn up at a site bounded by Broad Street west to 16th Street and Norris Street south to Montgomery Avenue, will give the university long-term financial flexibility, inspire a livelier campus atmosphere and support the academic mission with additional resources for research. The Rev. William B. Moore, pastor at 10th Memorial Baptist Church in North Philadelphia, told PhillyVoice that Ambler represents a viable alternative. "It's certainly a much more suitable place than 15th and Norris," said Moore. "One of the residents put it bluntly: It's like trying to put a whale in a grocery store. It further adds to the deterioration of the quality of life in the neighborhood. There's a lot of other choices they have. The Linc. Franklin Field. And now Ambler." The logistics of an Ambler stadium raise several obvious questions about anticipated attendance at Temple's home games. Would students commute from Philadelphia to Ambler? The train station at the west end of downtown Ambler is about 2 miles from Skip Wilson Field, while the Route 309 exit is just a few steps away. Two years ago, Temple contracted nationally renowned architecture firm Moody Nolan to lead the university's $1.25 million stadium feasibility study. The goal was to design a facility with minimal impact on the surrounding neighborhood while offering resources to the community. A proposed Alpha Center would provide early childhood education and behavioral health services. Renovations would also be made to the neighborhood's existing Amos Recreation Center. Other plans to integrate community job training and other opportunities outside the stadium's retail properties have not yet been publicly revealed by the university. A public town hall meeting held in March descended into chaos within 10 minutes. University officials had declined to attend a community rally at a nearby high school a week earlier. Moore said there has been no contact made with the coalition since that meeting. "The first meeting fell apart simply because Temple was justing reading a report to the community, not creating a time to seek their input," Moore said. "Thats not going to fly. those days are over. It's not about money now. It is about the preservation of our history." The stadium is proposed for the west side of Broad Street, just north of the Liacouras Center. The property is owned by the university. 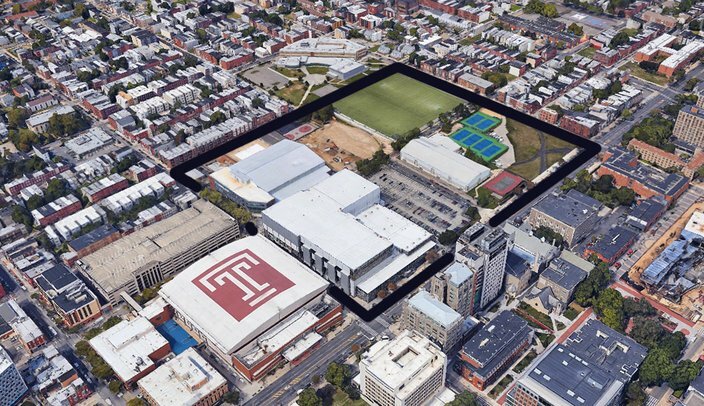 A spokesperson from Temple's Ambler campus referred an inquiry about the Skip Wilson Field proposal to main campus officials, who declined to comment on the flyer. Moore compared the current situation to Chinatown's successful resistance to the construction of Citizens Bank Park before the Phillies decided to remain at the Sports Complex in South Philadelphia. The difference in this case is that the university owns the land in North Philadelphia, while the Chinatown proposal involved a more complex array of land rights and required broader public support. Even with full ownership of the land in North Philadelphia, any move toward construction will require approval from the City Planning Commission and City Council. "If the Chinese are able to protest a stadium in their neighborhood, it doesn't make sense why African-Americans would be protesting for three years and still not have it get through to them," Moore said. "This isn't just about Temple. It's police. It's the fire department. We need to hear from city officials. Ultimately they have a significant nickel in this dime."